The Vegan Outreach Blog: The Vegan Outreach Blog is Moving! You may have noticed a silence in activity here since August. This is because we were busy getting our new website ready and moving our blog to VeganOutreach.org. This will be the last blog post in this location. All current email subscribers will be automatically subscribed to the new blog. If you subscribe to our blog via a feed reader, the new RSS feed is http://veganoutreach.org/feed/. In related news, Toni Okamoto, founder of Plant-Based on a Budget, has joined VO as our new Vegan Food & Lifestyle Coordinator! 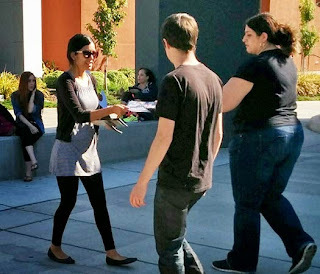 Toni Okamoto hands out Even If You Like Meat at American River College. Toni has been with us since August, helping to revamp our website, upgrade our literature, review cookbooks, and set up fundraising dinners. In addition to vegan food and products, we’ll continue to post on VO’s outreach and other relevant news items. Thank you for being part of Vegan Outreach, and we hope you like the new blog!